Nigeria's notoriety is unsurpassed in West Africa: institutionalized corruption at all levels, pervasive violent crime including highway banditry, and political and tribal tensions that risk to spill over into full-fledged combats at any moment. Our guidebook stated that they were unable to conduct on-the-ground research due to security issues in the country. Hardly the stuff that entices tourists. But, if we were to head further south we knew there was no way of circumventing Africa's most populous country, so we ignored the US State Department's travel warning and decided to give Nigeria a go. 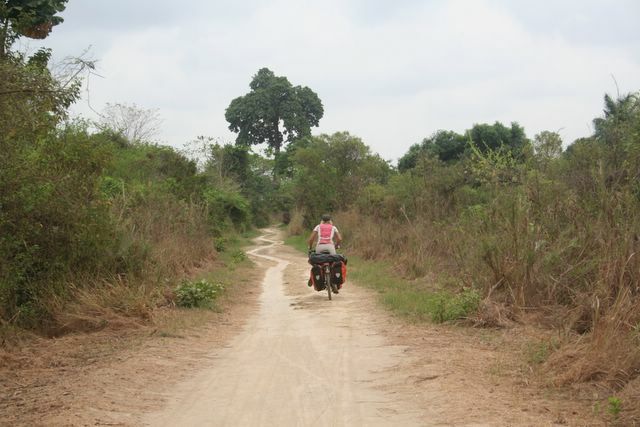 We had chosen a little-used border crossing in order to avoid Lagos, and as the tar road gave way to an ever narrower and bumpier dirt track, we were asking ourselves what was in store for us. As we rode up, there was much excitement at the border post on the Benin side--they were obviously not accustomed to foreign travelers passing through their tiny village. Someone was sent off to find the official and dig out the necessary exit stamp. The formalities were long and drawn out, and just as the official was placing the stamps in our passports, he informed us that he felt it was his duty to make us aware of the security situation across the border. 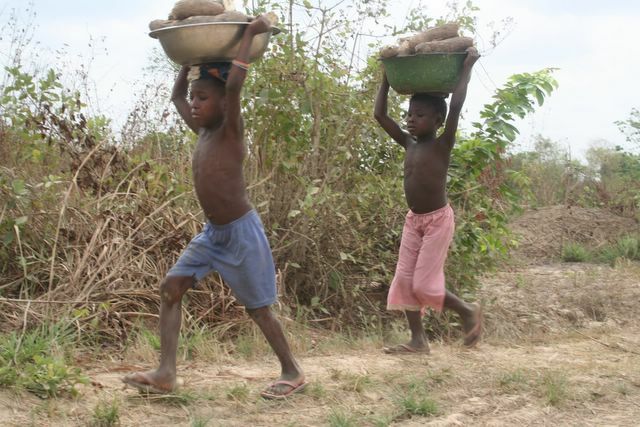 "There's nothing but bush for the next 25 kilometers--no villages, no people, no water--absolutely nothing. It's not unknown for bandits to attack along that stretch of road,' he continued. 'Just last Wednesday some armed thugs attacked a mini-bus and and took all the passangers' money and valuables." Now, why hadn't he mentioned all this BEFORE he put the exit stamp in the passports? There was no turning back, so we took the precautionary measures of stashing our cash inside the pots and pans, and hiding the expensive camera in the bottom of the sack. We left some decoy money and the small camera in the bar bag. 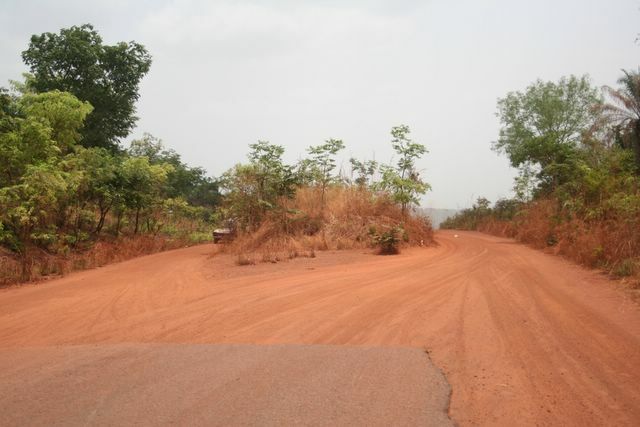 As expected, there was little traffic on the 'road', and the track on the Nigerian side was even sandier and rougher, which made progress very slow. 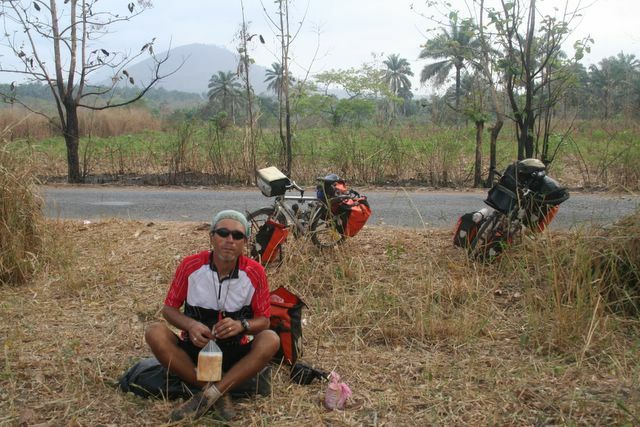 After several kilometers of slogging along, we sat down by the side of the road for a much-needed rest. As we were downing the last of our provisions (we had expected to find shops and roadside restaurants)three men on a motorbike pulled up next to us. They didn't look dangerous and we'd been told that bandits normally hide in the bushes and then jump out for a surprise attack, so we weren't feeling overly threatened. 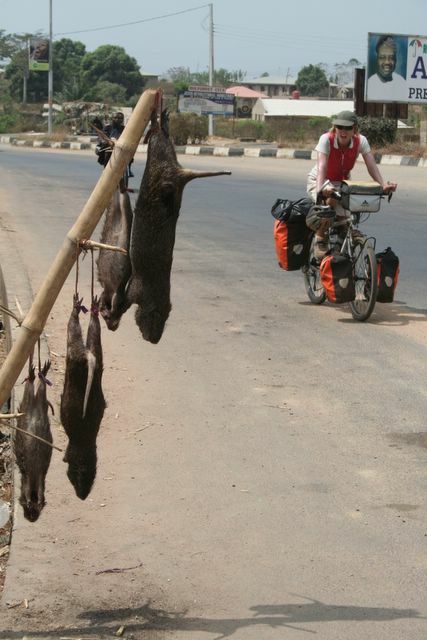 In fact, the men were merely curious and just wanted to welcome us to Nigeria. We were relieved. They confirmed that the road was indeed a favorite spot for attacks, and tried to reassure us by telling us that they would be 'praying that we meet no bandits in Nigeria'. Well, we didn't, and the people we did come into contact with were some of the friendliest and kindest we've met in Africa. Yes, the people are lovely, but the country itself is in an advanced state of decay and dilapidation. 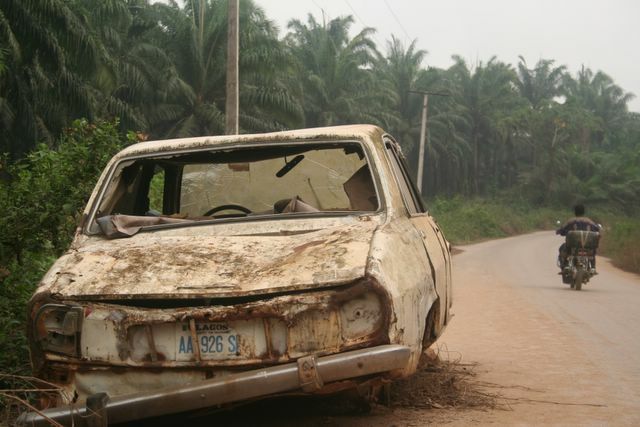 Wrecked and rusting vehicles line the roads, attesting to the recklessness of local drivers. Porches are sagging, paint is peeling and once stately colonial-era buildings are now crumbling and occupied by poor families. Running water is a rarity and it's even hard to find a pump that's working--they're 'spoiled' as the people like to say and nobody knows to fix them. We saw electricity poles all over the country, but rarely was electricity supplied. "The NEPA (Nigerian Electrical Power Authority) has taken the lights again, we must on the gen (turn on the generator)." To the locals, NEPA is better known as Never Expect Power Again. Seems about right. 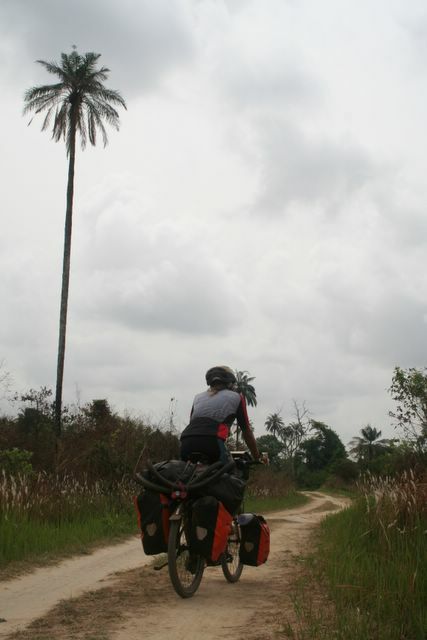 We cycled through Nigeria quite quickly, not taking a rest day until we reached the southern coastal city of Calabar (clean, green and well-ordered, unlike the rest of the country), just 120 kilometers from the Cameroon border. We followed a fairly central route, wanting to avoid the states north of the Niger River where Islamic sharia law is in force (given the heat, Amaya wasn't keen on covering up from head to toe) and the oil-rich southern Niger Delta region where kidnapping of expats is on the upswing. There were no spectacular tourist sights to visit, but cycling alongside a lorry which is being simultaneously overtaken by two other overloaded trucks on an uphill stretch of a two-lane highway while a motorcycle tries to pass on the right, leaving cyclists to flee for cover in the bush (shoulders on roads are also a rarity) is another kind of unforgettable experience. 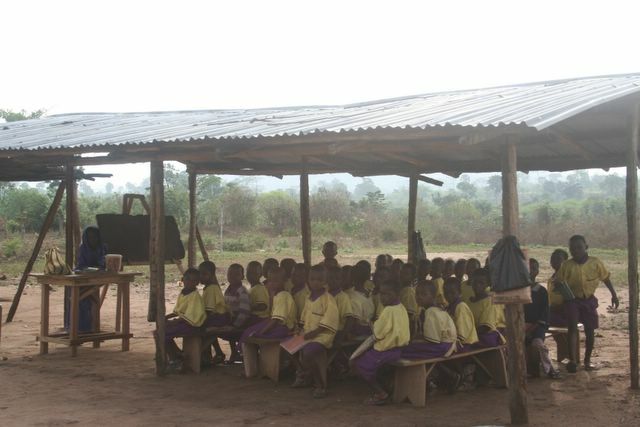 Nigeria brought a renewed sense of adventure we hadn't known since Sierra Leone. Arriving late one evening in Uromi we got caught up in a local political rally. The streets were thronged with people shouting slogans and young hotheads on motorbikes were weaving wildly through the crowd. This was just the type of situation those travel warnings (and common sense!) told us to avoid. We did our best to remain calm, and there was no reason to believe that the demonstrators were anti-Westerners, but it seemed things could turn ugly at the slightest wrong move. We were in a hurry to find lodging, and relived to see a sign advertising the Moonlight Motel. The hotel manager, however, was reluctant to show us a room. "You white people cannot sleep in such a place, I am sure of it," he insisted. "Why not?" we asked. "There is not enough comfort for you. You do not know how to use a pit toilet". There was a toilet. This was good news. On our first night in Nigeria, in some remote village not far from the border with Benin, the only lodging available was a room behind a bar where it turned there was no toilet. We were told to use the bush, which was fine, except that in the middle of the night Amaya awoke with an urgent need to use the facilities and found the doors all tightly padlocked. It was a long and uncomfortable night. In the end, we took the room at the Moonlight Motel and had a pleasant evening chatting with Happy, the hotel manager, his two sisters and several neighbors who had come by to have a look at the exotic tourists. In out-of-the-way places we always attract lots to gawkers. Most adults are subtle about it, but when one man was asked what he was doing outside the guesthouse gate he shamelessly replied, "I have come to look at the white woman." As if Amaya were some sort of zoo attraction! Nigeria boasts some of the highest highway death tolls in the world, so we prudently decided to stick to minor roads as much as possible. As we left Happy and friends behind, we set off on a fine paved road through some rolling hills, lush forest and wooded savanna. After a few hours ride we spotted the Niger River in the distance and soon arrived at the town of Illushi. Locals had assured us that there would be a ferry here to take us across (some even said there was a bridge!). There was nothing of the sort, and as we made our way to the waterfront a crowd quickly gathered. The villagers seemed perplexed and asked where we were headed. We too were perplexed, as we could see no obvious road on the other side of the river. After being assured that the road continued on the other side, we negotiated a canoe to carry us across the Niger. On the opposite shore of the river, the boatmen kindly pushed our bikes through the deep sand and told us they would take us to the road. They had been pushing an awfully long time and still no road was in sight. We were getting worried. Finally a narrow track appeared and then a cluster of huts. The road must surely be connected to this village, we thought, and said goodbye to the boatmen and thanked them for their help. This was a mistake since nobody in the village seemed to understand English (Nigeria's official language) and we couldn't find a road per se. Confident that we were headed in the right direction, we continued down the dirt track and hoped for the best. After an hour or so some motorcyclists appeared. We flagged them down and were thankful to find they spoke English. Apparently there was nothing in the direction we were headed. If we continued we would go only deeper into the bush and would never reach a road as such. This was bad news. We were told to backtrack and follow the piste along the river north to the town of Idah. We cursed our Michelin map for carelessly drawing a road where none existed and then turned around. It was an arduous day cycling, but when we finally arrived in Idah the locals were so welcoming that we soon forgot the difficulties. The next morning a local photographer was waiting outside of our room to 'snap' us with the proud guesthouse manager. We were very flattered. 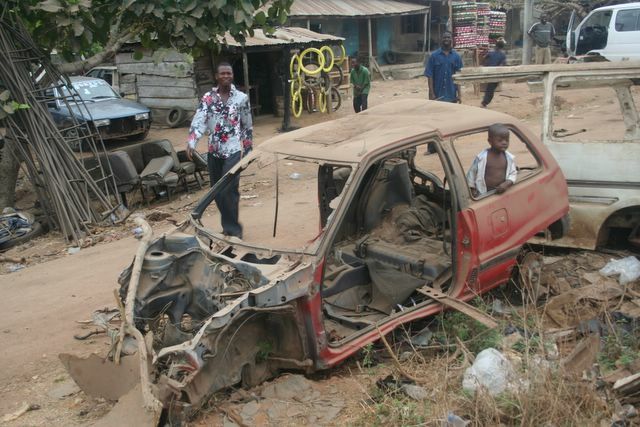 Roadblocks are commonplace throughout Nigeria. 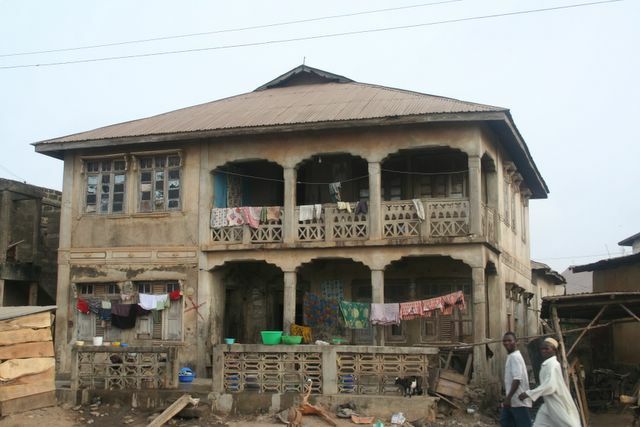 Ostensibly in place to maintain security and deter would-be bandits, in reality they're a lucrative source of income for the local police and military. Nobody's duped into believing the security forces are there to serve, and money can be seen changing hands quite openly. On busy roads we passed up to 20 roadblocks in a day and are pleased to report that we almost always road through without a hitch. Our strategy was to grin widely and wave furiously as we enthusiastically greeted the officers in charge ( Gooood moooorning, sir! Hooooow aaaare yoooouuuu?) and be on the other side of the checkpoint before they could stop us. The officers had no choice but to wave back and return the greeting, lest they appear inhospitable towards foreign tourists. Only once were we stopped by a military man toting some sort of semi-automatic rifle who wanted to get the lowdown on our trip and scrutinize our passports. He had obviously had too much palm wine and we let out a sigh of relief we he finally let us go. Nigeria has left us with mixed feelings. While we loved the people, and enjoyed a variety of spectacular scenery from the stark beauty of the savanna to wild Tarzan and Jane jungle, we can't help being saddened and appalled at the lack of progress in a nation with such potential. Travel here isn't for the faint-hearted, but it does have its rewards if you keep an open mind and have a dose of good karma.